Even though I have not been to neither of Einat Admony’s two long standing New York favorites, Taim and Balaboosta, she clearly has churned out some fantastic tasting Middle Eastern cuisine so I was very intrigued by her newest venture, Bar Bolonat located on the corner of a quieter section of Hudson Street. An intimate bar focused on modern Middle Eastern cuisine, Bar Bolonat was a perfect place to relax and catch up with a friend on a Friday night. The restaurant was bustling when we walked in at dinner time but we managed to find a two seater at the bar as a larger party vacated to claim their seats in the small dining room. 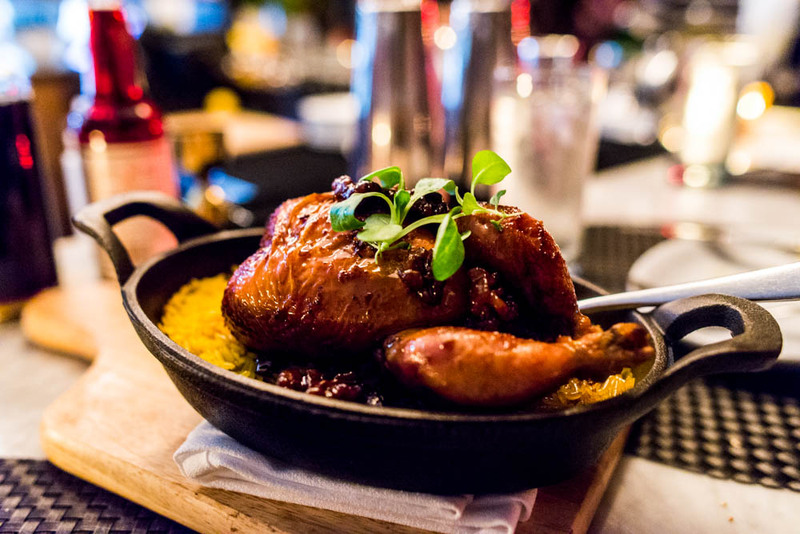 The menu is organized into three sections, nibbles, small plates and larger plates all meant to be shared. Neither of AD nor I were starving so we decided to share a few small plates and one entree. Our appetizers started with Bar Bolonat’s famous Jerusalem bagel, a sesame covered oval bagel fresh out of the oven, served with za’tar and olive oil. Made in house, this was flatter than the New York bagels we know but was still light at fluffy, not at all dense. 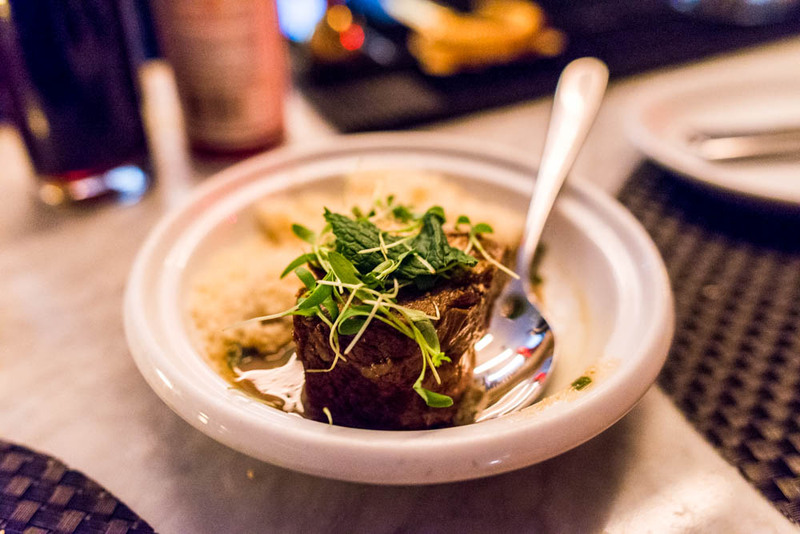 The zabzi tagine featured a smaller than expected piece of short rib with housemade couscous studded with almonds and herbs. The short rib was tender and fatty, full of flavors imparted by spending a long time in the oven. Two plates of vegetables, everyday cauliflower and Japanese eggplant. 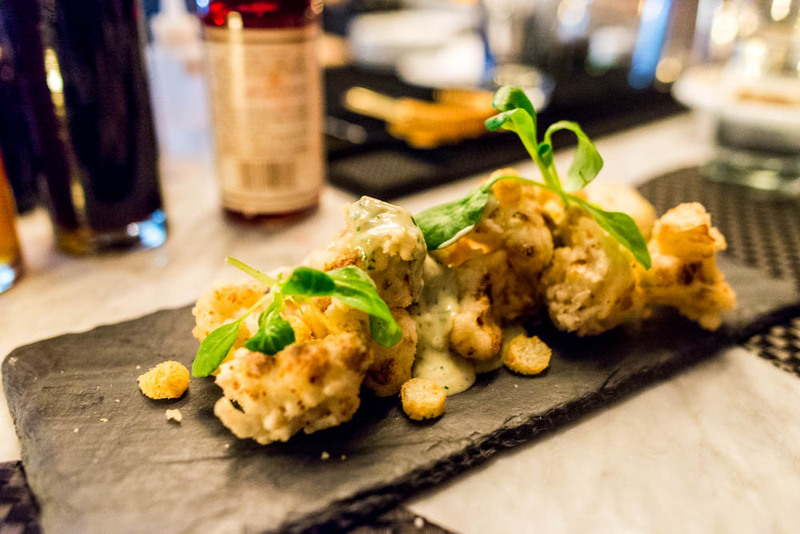 The cauliflower was lightly fried and served with a peanut tahini sauce which could have used a little brightness. 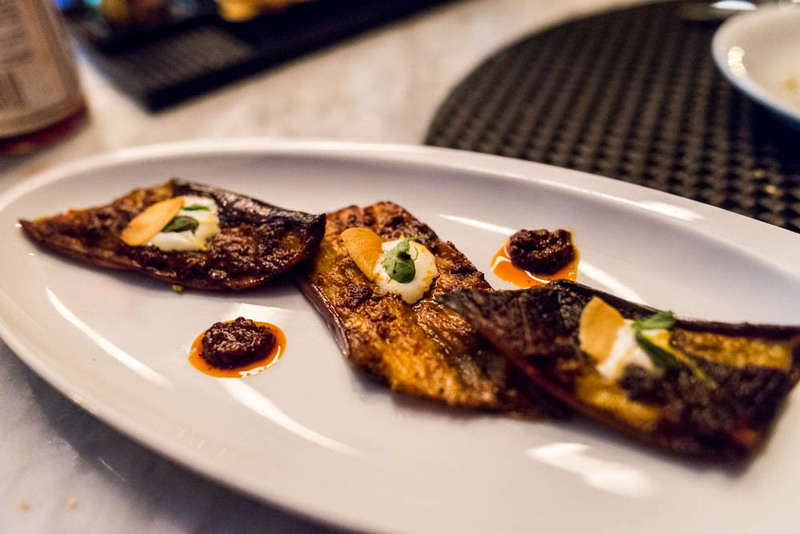 Japanese eggplant was sliced thinly and grilled until extremely tender then topped with a powerful smokey harissa sauce. I loved the idea of incorporating the non-native ingredient and just wished that there were more slices to the serving. For our larger plate, we opted for the poussin. The young chicken was coated in a dark and sweet pomegranate glaze and decorated with a few roasted walnut pieces on top. The skin was beautifully crispy, not an ounce of fat in sight, and the meat underneath juicy and flavorful. The small bird perched on top of a generous serving of crispy Persian style rice, which absorbed all the juicy goodness from the chicken as we took it to ourselves to carve the bird. It was worth every little bit of effort necessary, the rice was exploding with flavors, sweet and savory all in happy harmony. We managed to leave a little room for dessert so a bowl of the halva creme brulee it was. 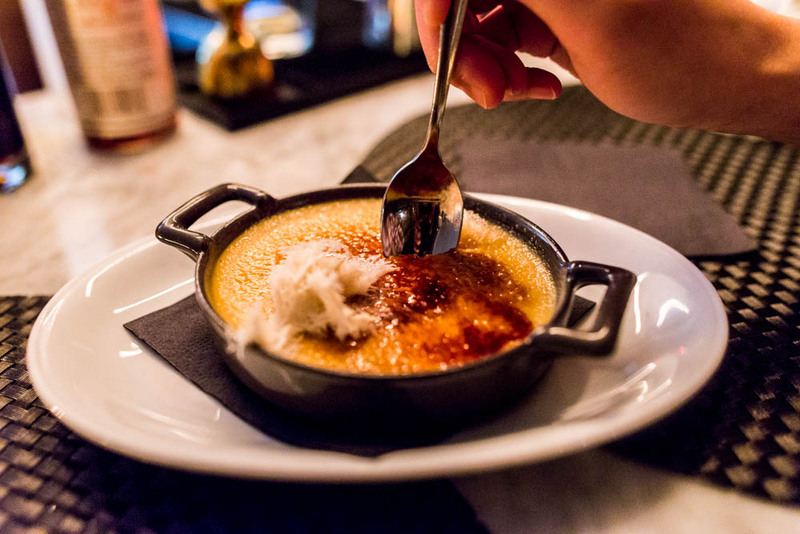 It was great as far as creme brulee went, just the right amount of crunchy sugar shell and a creamy not heavy inside. The halva served to add a Middle Eastern twist to a pretty good version of creme brulee.